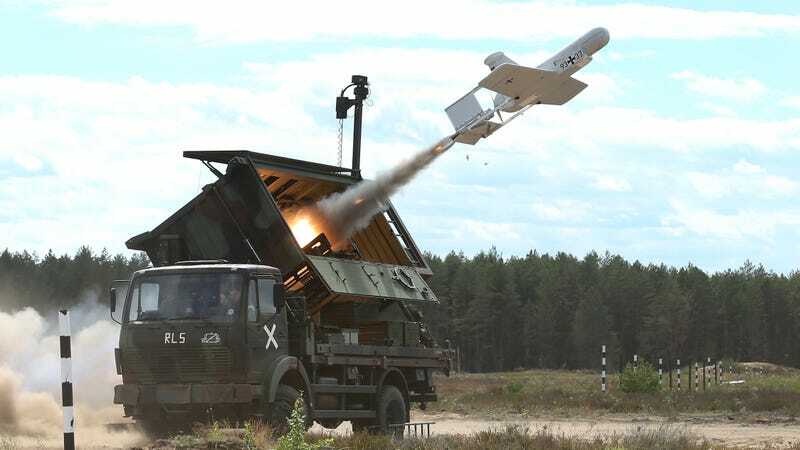 A KZO reconaissance drone of the Bundeswehr, the German armed forces, launches with the help of a booster rocket during Thunder Storm 2018 multinational NATO military exercises on June 7, 2018 near Pabrade, Lithuania. Hundreds of companies and thousands of individuals, many of them researchers and engineers prominent in the fields of robotics and artificial intelligence, vowed on Wednesday never to apply their skills toward the creation of autonomous killing machines. Led by the Future of Life Institute, a Boston-based nonprofit, as many as 160 AI-related companies in 36 countries, and 2,400 individuals in 90 countries, signed the pledge stating that autonomous weapons posed a “clear and present danger to the citizens of every country in the world,” and that they would not participate in their development. The signatories, who join 26 United Nations countries that have explicitly called for a ban on lethal autonomous weapons, include DeepMind, Google’s top AI research team; the European Association for AI; ClearPath Robotics/OTTO Motors; the XPRIZE Foundation, the Swedish AI Society; and University College of London, among others. Leading AI researchers Demis Hassabis, Stuart Russell, Yoshua Bengio, Anca Dragan, Toby Walsh, and Tesla and SpaceX founder Elon Musk are among the individuals who also signed the pledge. Engineers and scientists, in the wake of the U.S. government’s escalation of military drone use across the world, have warned that autonomous machines will be vulnerable to hackers, could be hijacked and turned on innocent populations, and that they will inevitably be easy for malicious actors to obtain and build on their own. The “Slaughterbots” video was created by the Campaign to Stop Killer Robots, an international coalition working to ban autonomous weapons. “No nation will be safe, no matter how powerful,” said Clearpath Robotics CEO Ryan Gariepy in a statement. The signatories of the Lethal Autonomous Weapons Pledge further urged the UN, which will meet on the issue of autonomous weapons in August, to develop a commitment between countries that will lead to their prohibition. Additional reporting by George Dvorsky.